Lincoln Motor Car Foundation (LMCF) LIFE MEMBER CARDHOLDERS who reside in the U.S. are eligible for the Ford Motor Company X-Plan, a partner discount program for new Ford and Lincoln vehicles. This discount applies to the vehicle’s MSRP and can be as much as 5%, depending on the vehicle selected. To qualify for this discount you must obtain an X-Plan PIN number which you provide to your Ford or Lincoln dealer before purchasing your new vehicle. The name and address that is used to generate your X-Plan PIN must match the name and address on the vehicle registration and sales agreement. Lincoln is offering an additional $750 Bonus Cash on the entire lineup of impressive new Lincoln Vehicles. As a benefit of being a Life Member of the Lincoln Motor Car Heritage Foundation, Life Members are eligible for the Ford Motor Company X-Plan, a partner discount program for new Ford and Lincoln vehicles. 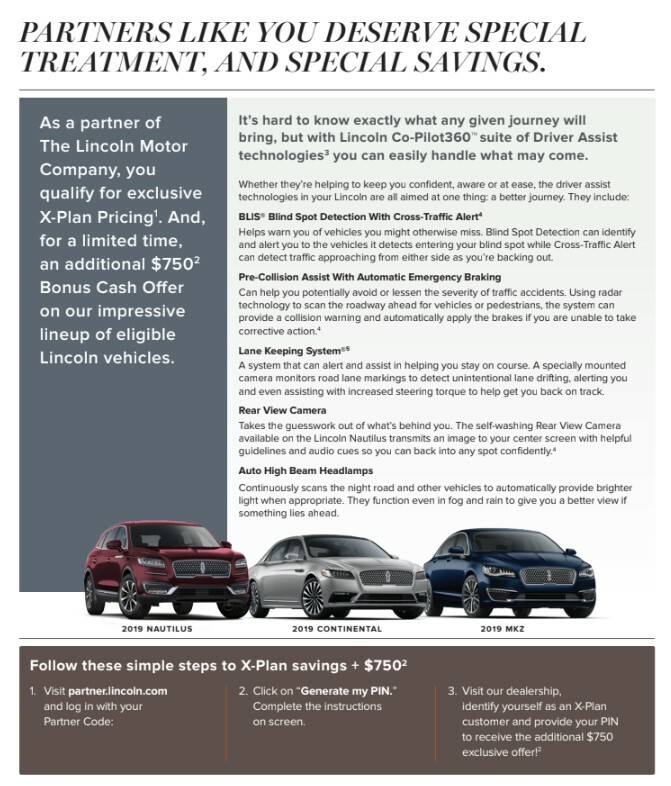 Life Members can now get X-Plan Pricing PLUS $750 Bonus Cash PLUS current retail incentives on any new Lincoln. Please see the attached flyer for additional information. To request an X-Plan Discount, please fill out the application below. To apply for an X-Plan PIN, please fill out the information below and click 'Submit'.